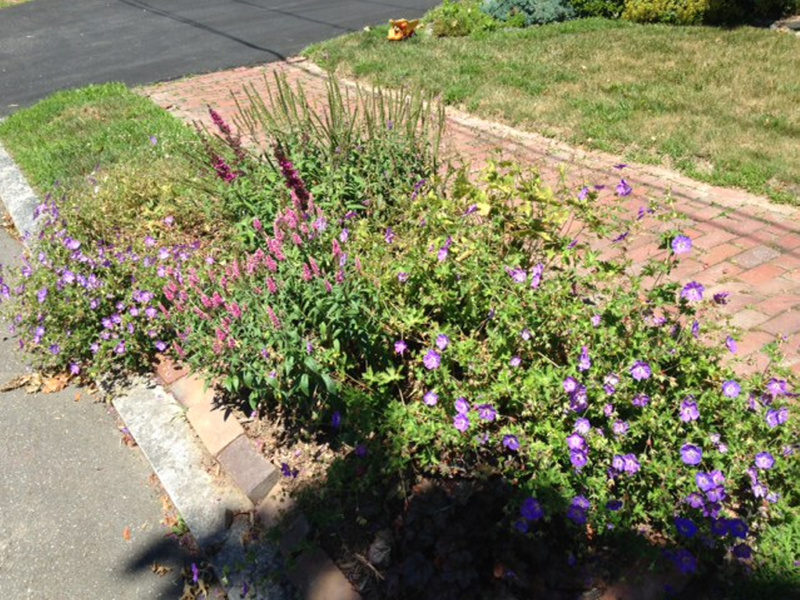 That bit of land between the sidewalk and the street can host a range of tough, hardy plants. Among the toughest places to grow plants is the strip of land between the street and the sidewalk in any town or city. The standard practice is to grow lawn there, but grass does poorly because the soil is poor, it gets hit with road salt, and it is difficult to mow and irrigate except by hand. The strips result because municipalities put the edge of a sidewalk at the limit of the public right of way, Tarling said. Sidewalks are usually about 5 feet wide, and the paved area for traffic is determined by traffic density. The esplanade is the area left over in the right of way after all other needs are met. Barbara Freeman has maintained this hell strip for almost 10 years on the corner of Lincoln and Beacon streets. Historically, the area was called park space, as in a municipal park, and our expressions to “park a car” and “parking lots” derive from this. Once cars arrived on the scene, drivers would “park” cars at this park space next to the street, Tarling explained. Ten to 15 years ago, the idea of planting something other than lawn in these areas began taking hold in Portland. The West End was one of the first areas in town to adopt the practice, and the city welcomed the change. Homeowners may plant whatever they like in the esplanade, but the city does offer guidelines. For starters, herbaceous perennials do better than trees and shrubs. Perennials die back to the ground every fall, so, unlike trees or shrubs, come winter they won’t be damaged by plows or the heavy snow load they push onto the strip. Also, because people will be walking, jogging or bicycling by the plantings, it makes sense to avoid plants with thorns. And because people pulling out of driveways need to look for and be seen by approaching traffic, it’s best to stick with plants of 3 feet or under. Hardy plants that can tolerate poor soil and drought are also best-suited to esplanades. Echinacea and rudbeckia are two that come to mind immediately, and daylilies also do well. Tarling said that Falmouth has used a lot of Nepeta, or catmint, on the built-up section of Route 1 (and I have noticed catmint in two road islands planted in Cape Elizabeth, where I live, last summer). Ornamental grasses, irises and daylilies are other ideas. 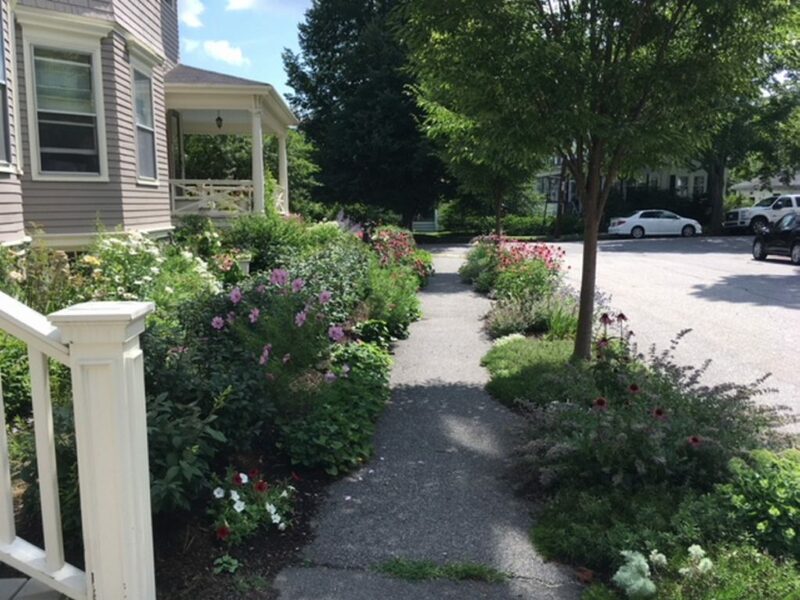 Gretchen Lane, who maintains this planting on Parsons Road, says there are several others like it in her neighborhood. Why drought-tolerant plants? Because much of the rainfall that falls near the plants in the esplanade will run off onto the pavement and into the nearest drain catch basin, and watering with sprinklers or drip hose would be difficult. That said, Tarling suggested that people creating new esplanade gardens add compost to help retain moisture. Many of these hell strip gardens are packed with spring-flowering bulbs such as crocuses, which get the growing season off to a colorful, cheerful start. Then come daffodils, which have varied bloom times. Tulips are next, if passing traffic will keep the deer away, followed by alliums. For people willing to do a bit of hand watering, the options are greater. Maeve Pistrang, who lives in the Libbytown section of Portland, said the esplanade is the sunniest spot on her property, so she has planted pumpkins, butternut squash and sunflowers there. 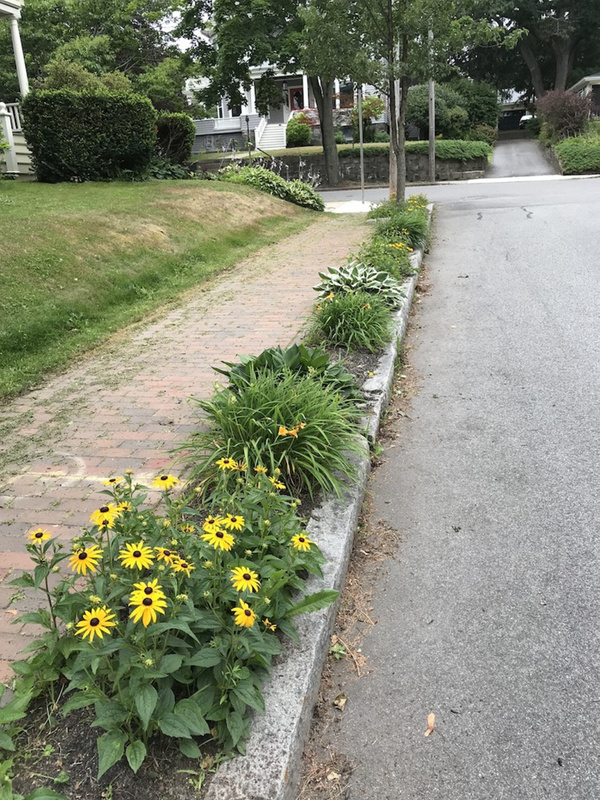 Others, like Debra Flynn on Hartley Street, makes sure that what she plants will benefit pollinators and other wildlife. When I interviewed Tarling for this column, he suggested the paper hold a contest to select Portland’s best esplanade gardens. But we support all gardens planted in underused pockets of urban land such as esplanades, where plant life can help support pollinators and other insects and birds, so rather than make judgments, my editor and I hope to encourage everybody. We simply asked readers for photographs of their esplanade gardens; they accompany this column. First, dog walkers let their animals use the gardens for their business, occasionally digging up or otherwise damaging plants. And next, gardeners objected to our decision to do this column in the middle of a challenging (read: dry and hot) summer, when these gardens are not at their best. I promise that if I revisit this topic in a few years’ time, I’ll do so in May.